Leveled by an Earthquake by Adam Reingold. 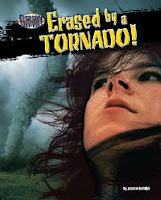 Erased by a Tornado by Jessica Rudolph. Grades 3-6. Bearport, 2010. Review copies provided by publisher. 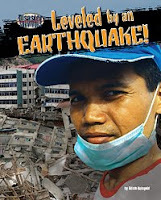 Kids love books about disasters. Every week it seems like I get kids in my library requesting books about the Titanic, tornadoes, volcanoes, hurricanes... And what's not to love? They're full of drama. And reading about disasters in books gives kids a chance to experience the event from the safety of their bedroom. In Bearport's new Disaster Survivors series, kids can read all about different natural disasters like earthquakes, blizzards, tsunamis, and tornadoes. The books are vivid, containing full-color photos and sidebars with extra information. The text is informative but not overwhelming, so this is a great recreational choice for kids who are not so into reading. Both Leveled by an Earthquake and Erased by a Tornado start off with a specific event (for Earthquake it was the 2008 Sichuan China earthquake, for Tornado is was the 2008 tornado in Jackson, Tennessee). Each title tells about the event from the point of view of one of the survivors, complete with photos. Then we learn a little bit about the particular disaster - what caused it, if scientists can predict it, etc. And each book includes some information about what to do if you find yourself experiencing that particular disaster. I'd definitely recommend these titles for library shelves - the high-interest topics and appealing visual presentation will have them flying off the shelves*. Consider them for updating your collection if some of your older titles are getting dated or worn. Happy Nonfiction Monday! Go check out this week's round-up at Shelf-Employed. *Flying off the shelves in a good kids-are-checking-them-out way, not in a bad we're-having-an-earthquake-or-tornado way. My son is very interested in natural disasters of all kinds. I'm sure he would enjoy both of these books. Very timely books. We felt the earthquake that hit on Easter Sunday. I'm sure kids will be looking for more information.